TIGARD — There were smiles to be found all around. 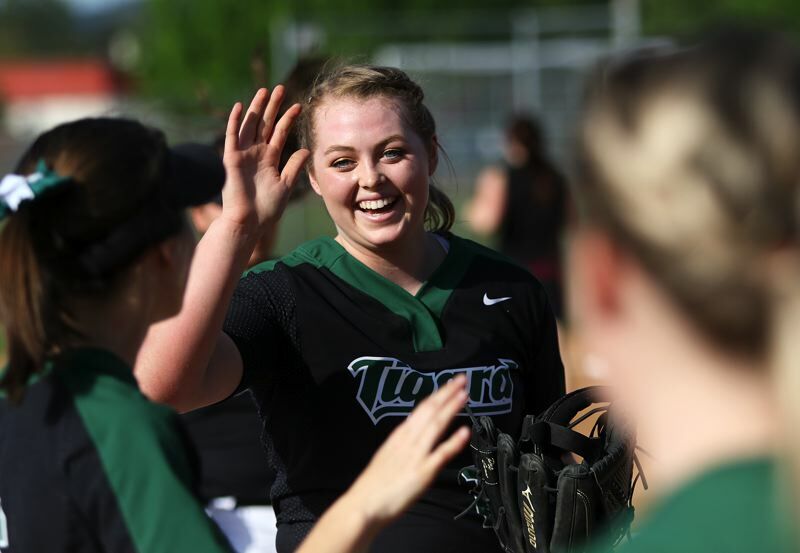 The Tigard High School softball team was smiling about picking up a hard-fought victory. The Sherwood High School softball team was smiling because it had just given the Tigers, the No. 2 team in the Three Rivers League standings, and a top-10 team in the OSAA power rankings, quite a battle. And both squads got to celebrate a well-played game. 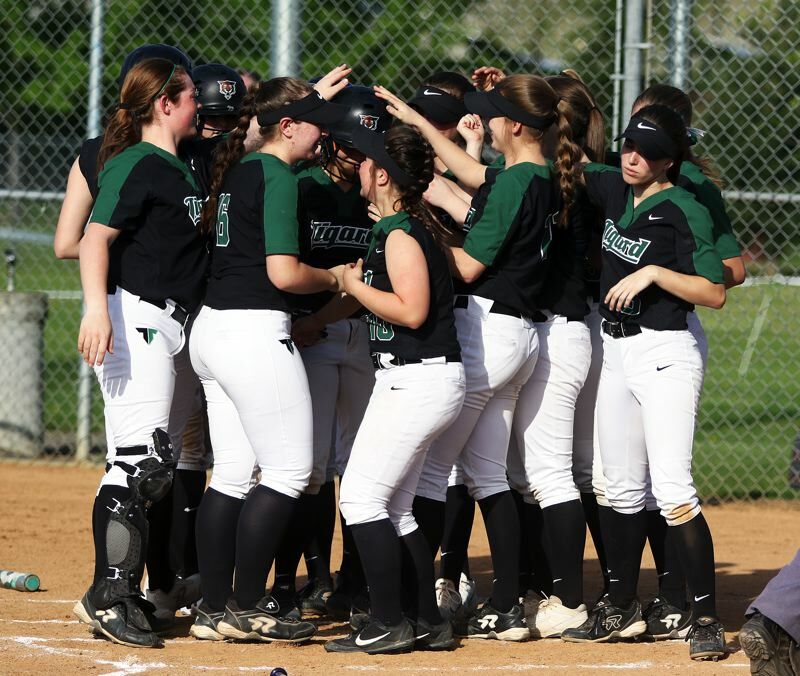 And it was a game that saw Tigard come away with a 3-1 win over the Lady Bowmen in a Three Rivers League contest played April 25 under warm, sunny skies at Tigard High School. "It went pretty good. 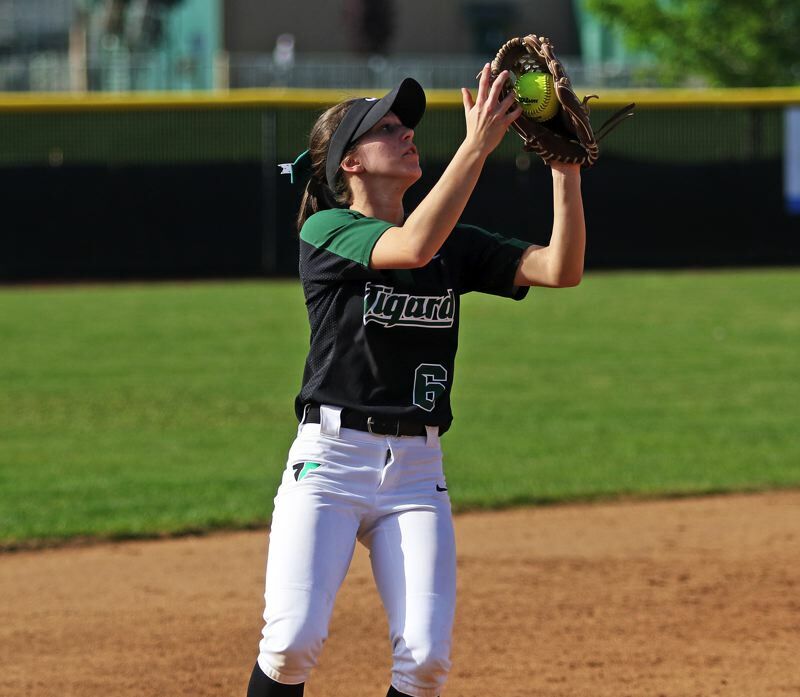 We had a pretty good game, overall," said Tigard freshman second baseman Katie Regalado, who hit a go-ahead two-run home run in the contest. "I think we struggled a little bit with the heat. We were having a pretty good day, but we just kept hitting the ball right at people. I think we did really good defensively." 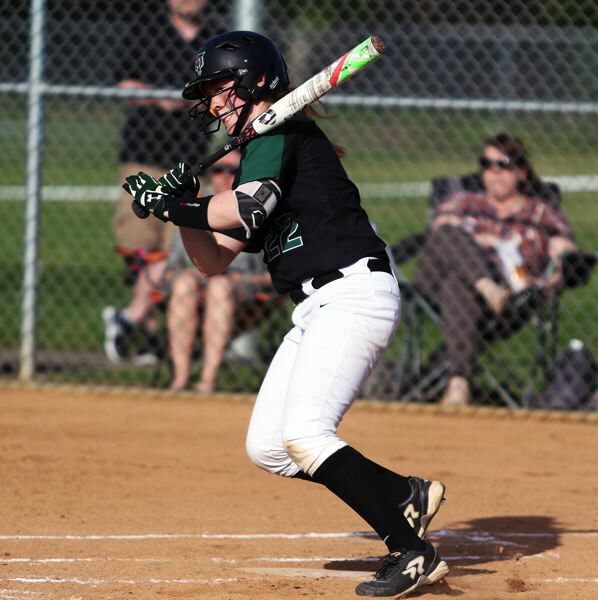 "I thought we played pretty well as a team," said Tigard sophomore catcher Emily Paulson, who doubled in the other Tigard run. "Maybe we could have had a bit more energy, but it was one of the first hot days, and I thought we played pretty well defensively." With the win, Tigard improved to 6-1 in TRL play (16-2 overall) at that point, keeping the Tigers in second place in the league standings. 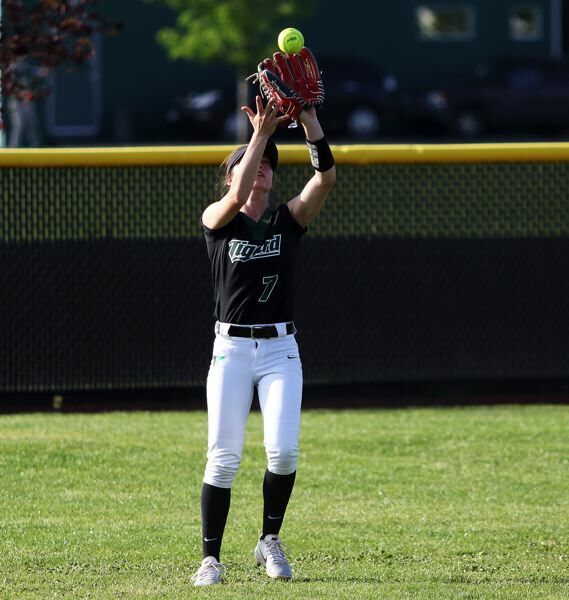 "This was good for us, especially going into the second round of league," Tigard senior pitcher Ashley Davis said of the close contest. "Anyone can beat anyone on any given day." With the setback, Sherwood moved to 0-7 in TRL games (2-15 overall) at that point. But the strong performance has the Lady Bowmen optimistic for the rest of the season. "I think we did really well," said Sherwood sophomore shortstop Jordyn Moullet-Dozier, who scored the Lady Bowmen run in the contest. "We held them pretty good, and I know they're a good team. We've been working really hard to better our team." Sherwood, in last week's game, took a 1-0 lead with a run in the top of the fourth inning. Moullet-Dozier, leading off the frame, reached base on an infield single. "I love leading off. It's great," Moullet-Dozier said with a smile. "You get to be on, and I know I'm a little bit fast, so I get to speed around the bases. It's a lot of fun." One out later, Sherwood sophomore Morgan Hodge drew a walk on a 3-2 pitch. One out after that, Bowmen senior Emily Watson reached base on an infield single, loading the bases. Sherwood sophomore Olivia Dirks then walked on a 3-2 pitch, bringing in Moullet-Dozier with the game's first run. But that didn't seem to bother the Tigers. "We were thinking that we needed to battle it out," Regalado said. "Our energy was low at times, so we upped our energy. We all got together as a team and said 'we need to get some runs.'" "I was thinking we just had to get out of the inning, and our bats would come around at some point," Davis said. Davis got things going for the Tigers in the bottom of the fourth inning with a one-out double to left field. Regalado, up next, then belted a two-run home run, her second of the season, over the fence in left field, giving the Tigers a 2-1 lead. "It was great. It felt really good," Regalado said. "I was really excited, and it was exciting for the team." "That was awesome," Davis said. "It was much-needed and I was super happy for her." Tigard got the game's other run in the bottom of the fifth inning. Junior Maddie Hoover had a two-out infield single, and then she scored on Paulson's double to to right-center field, wrapping up the scoring in the Tigers' 3-1 victory. "It went well," Paulson said. "We kept calm, even when they got ahead, which was good, because we hadn't been down much this year. I thought we played collectively." "It was a good team win," Regalado said. Tigard, as a team, had seven hits in the contest. Sophomore Elli Dardis went 2 for 3 at the plate. Hoover, Davis, Paulson, Regalado and sophomore Katelyn Erickson added one hit apiece. Davis, pitching all seven innings for the Tigers, gave up one run on three hits, while striking out nine and walking two. For Sherwood, Watson went 2 for 3 at the plate. Moullet-Dozier had the other hit for the Lady Bowmen. Dirks and junior Josie Reid, splitting the pitching duties, combined to give up three runs on seven hits, while striking out four and walking one. "I think we've improved a lot, and have been doing really well at the plate," Moullet-Dozier said. "It's been a lot of hard work. We've been working hard at practice, doing a bunch of drills and stuff. Our team is like a really close team. We always have each other's back." Both teams were back in action on Thursday. Tigard scored a 12-0 home win over Newberg. Sophomore Lexi Klum and Paulson each blasted a grand-slam home run in that game. Klum ended up with three hits, three runs scored and five RBIs. Davis had two doubles and also picked up the pitching win. Sherwood fell 10-0 at home to Lakeridge. 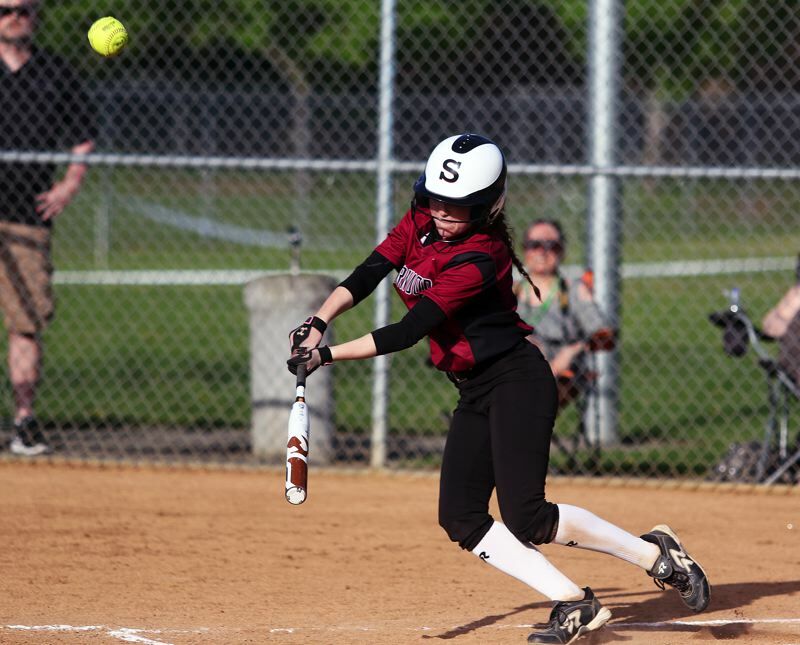 The Lady Bowmen bounced back on Monday to post a 7-4 home win over Canby. Sherwood scored all seven runs in the bottom of the sixth inning, erasing a 4-0 deficit. Watson went 3 for 4 at the plate with a triple and a run scored. Dirks went 2 for 3, with a double, a run scored and three RBIs. Reid added a pair of hits while also getting the pitching victory. Tigard was edged 3-1 at home by West Linn on Monday. Both teams will return to league play on Wednesday. Tigard will host Lakeridge and Sherwood will travel to Newberg for 5 p.m. games. On Friday, the Tigers will be home to face rival Tualatin at 5 p.m., and the Lady Bowmen will play at Lake Oswego at 7:30 p.m.